The free standing indoor and outdoor quartz heater with 3 heat settings offers convenient safe instant infrared heating. 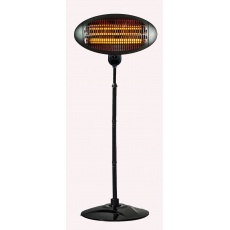 This heater is ideal for use outdoors has a garden patio heater or indoors for either domestic or commercial use has an office, small warehouse or garage heater. 3 Heat settings: 650W, 1350W & 2000W. Heated area 10 square meters. Instant heat with atmospheric orange glow light. Costs 14p (approx) per hour to run. Heats the people not the air. Overheat safety cut-out. Weighted base for extra stability. Adjustable height: minimum 1.8 metres, maximum 2.1 metres.